San Carlos GardenWorks :: Residential Landscape Design | Fine Gardening | Private Homes & Businesses | San Francisco Peninsula & San Carlos :: Karen Hunt | Creating beautiful and functional Western gardens that that are water-wise and low-maintenance. 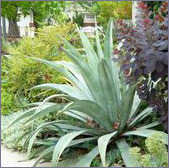 Creating beautiful and functional Western gardens that that are water-wise and low-maintenance. As California’s climate becomes drier, homeowners are under increasing pressure to reduce their water usage. In the current economy, many homeowners also have more limited budgets available to devote to external landscaping. This includes more limited dollars available for watering and maintaining our yards. But with these changes come opportunities to design and care for our gardens in new and interesting ways. Garden traditions are being redefined to reflect current knowledge about soil health and water-conserving landscape techniques. San Carlos GardenWorks can help you bridge between the old approaches and the new. Love roses? Check out the new Flower Carpet, disease-resistant roses. Can’t quite bring yourself to lose the grass? How about trying one of the new “no-mow” meadow grasses by Delta Bluegrass? With my Streamline Design Consult Service, I can now provide design assistance that is much less expensive than what a traditional landscape planning process would cost. Streamline Design Consults. Working on-site with you to redesign your existing outdoor spaces. If requested, I can also provide detailed information on how to most cost-effectively maintain your gardens, including simple ways you may be able to reduce your irrigation and maintenance bills. This is a very inexpensive service compared to more traditional design approaches where formal Architectural Plans are prepared. Full-on Residential Master Landscape Planning. Typically done for either new homes or remodels. Both of these are described under the Services section of my website. For additional information, please either give me a call at 650-302-5379 or send an email to: karen@hunt106.net.